Baltimore’s most vulnerable residents won an historic victory this October when City Council voted to fund their Affordable Housing Trust Fund to the tune of $20 million per year by 2023. Housing for All: Baltimore’s “Fund the Trust” campaign led the effort. The passed ordinance calls for excise taxes on the transfer and the recording taxes on real estate sales exceeding $1 million. The combined revenue are estimated to generate $13 million a year. On top of that, the mayor has agreed to allocate $2 million to $7 million annually that, by fiscal 2023, would provide a total of $20 million a year to the trust. Council Bill 18-0221 establishes a 0.6% excise tax on the transfer of real property valued at or above $1,000,000 and a 0.15% excise tax on the recordation of instruments concerning real property on transactions valued at or above $1,000,000. All revenue from the excise tax up to $16 million are dedicated to the City’s Affordable Housing Trust Fund. Revenue above $16 million in any fiscal year will divided with 50% dedicated to the Trust Fund and 50% to the City General Fund. This is an ongoing, annual commitment of $7 million/year beyond FY 2023. 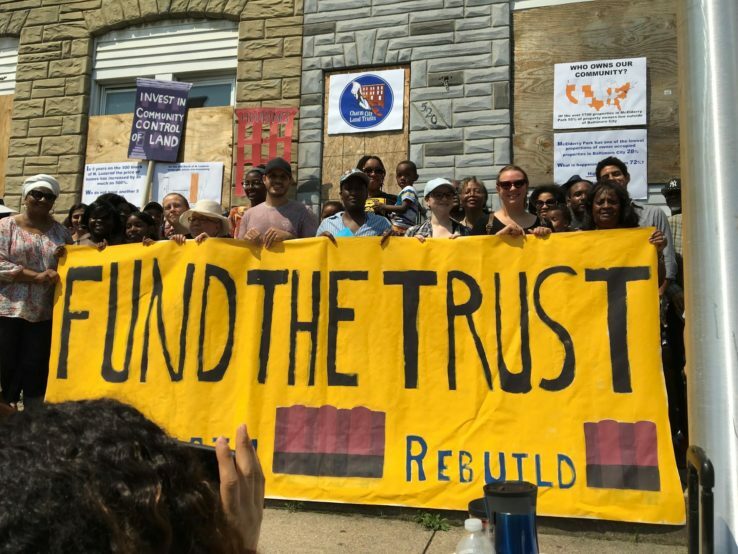 Housing for All: Baltimore’s Fund the Trust Campaign is the same Coalition that passed the Affordable Housing Trust Fund mechanism in 2016. That campaign sent a strong message when it won by eighty-three percent (83%) of Baltimore electorate voting overwhelmingly yes for Question J. This victory proved that voters in Baltimore wanted the City to invest in affordable homes. During Mayoral campaign, Pugh publicly supported the Baltimore Housing Roundtable 20/20 Campaign (a member of the original AHTF campaign) that called for $20 million in the capital budget for permanently affordable housing and $20 million for projects that employ community residents to deconstruct vacant building and create public green space. As recently as November of 2017, the Mayor pledged support. However, in her bond allocations, she had committed zero dollars. Keeping up the pressure, 20/20 Campaign members and United Workers delivered 20,000 signatures in support of their campaign to the budget office in Nov 2017. In January 2018, members from United Workers disrupted the budget priorities presentation of Michael Braverman the Commissioner of Department of Housing and Community Development because it had no funding allocated for the housing trust fund. After more than a year of working with the Mayor and City Council to find a revenue source, progress stalled. The Coalition members worked with the City Council, specifically Council member Bullock, to draft an ordinance that created new money to dedicate to the AHTF. Council member Bullock’s ordinance was introduce on April 2018 with unanimous co-sponsorship from the Council. As the ordinance stalled, the Coalition decided that if the City would not take action to fund the AHTF, they take it to the voters. In the June 2018, the Coalition and United Workers drafted and submitted language for a ballot initiative petition to change the Baltimore charter in order to fund the AHTF. Essentially, the proposed funding for the initiative was a mandatory annual appropriation of no less than $0.05 on every $100 of assessed or assessable value of all property in the city of Baltimore. Due to Maryland law, Baltimore voters could not levy new taxes or fees, but due to precedent, the Coalition was able to direct or dedicate existing revenue. Throughout the summer, the Coalition continued to work both angles, educating and lobbying City Council members to support Council member Bullock’s ordinance as well as continuing to gather signatures for the ballot initiative. This all came to a head as the August deadline to turn in signatures drew closer. The Coalition had gathered 15,000 of the needed 10,000 to get their initiative on the ballot. The Mayor’s office contacted the Coalition to negotiate a deal that was documented in a Memorandum Of Understanding (MOU) and laid out an agreement between the Mayor, the Council President and the Coalition members, signed on September 18th, to fund AHTF as described above without the need for a ballot initiative. Mayor Catherine Pugh announced at the signing of the MOU that $20 million is on its way to help tens of thousands of people struggling to keep a roof over their head in the city. “We believe this is an effort in the right direction,” Pugh said. However, the ordinance to fund the AHTF still needed the City Council’s vote. At a hearing on September 27th, the original ordinance was amended to reflect the signed MOU. At the same hearing, amendments to limit the scope of the funding for the AHTF were introduced. Advocates were able to beat back a 7-year sunset on the funding as well as amendments meant to exempt certain projects. Although, two exemptions did pass that exempted projects already in the development pipeline, the City projects that the one-time impact of the exemption will be approximately $1.2 million. The final ordinance passed three require readings in City Council and is awaiting an expected signature by the Mayor. “We will be using those funds to increase access to affordable housing, reduce poverty and homelessness, strengthen the economy, boost economic mobility, improve health outcomes and promote inclusive community development without displacement,” said Michael Braverman. The Baltimore AHTF can be used for predevelopment activities, capital and operating assistance for the creation of community land trusts, affordable and fair housing related services as well as administrative and planning costs. All housing assisted by the Trust Fund will serve households with incomes at or below 50% of AMI. At least 50% of the units in any three-year period must serve households with incomes at or below 30% of AMI. Furthermore, all rental housing assisted by the Trust Fund must have a minimum affordability period of at least 30 years. All homeownership housing assisted by the Trust Fund must meet affordability criteria based in part on the amount of Trust Fund monies invested in the unit. The fund will be administered by the Department of Housing and Community Development and overseen by a 12 member appointed commission of community members. The commission is comprised of some of categories of people such as a non-profit developer, a service provider, a realtor or homebuilder, mayoral appointee, a lender, but uniquely, they have included multiple people impacted by the housing crisis: one resident below 30% AMI and one resident below 50% AMI and homeowners who have benefited from a homeownership program. Due to the persistence, creativity and organizing of the Housing for All: Baltimore Coalition, Baltimore residents now have a significant investment that will begin to help all Baltimoreans have a safe, affordable place to call home. For more information contact Todd Cherkis at United Workers at tcherkis@hotmail.com or 410.230.1998.